This entry was posted in All Posts News Politics and-or Videos, Dandelion Salad Videos, Death-destruction, History, Imperialism, Politics, War and tagged American Revolution, Civil War, Howard Zinn, Must-See Video or Videos, WWII. Bookmark the permalink. You might want to read “Mr. Truman’s Degree” by Elizabeth Anscombe for a conservative take on some of the same issues Zinn talks about here. She argues that Truman should not have received an honorary degree from Oxford because he ordered the use of atomic weapons against Japan. 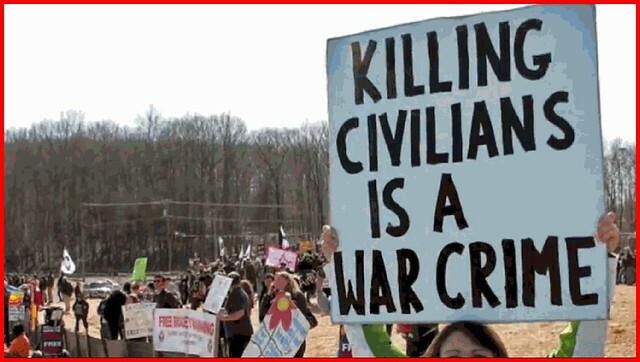 “Killing civilians is a war crime” it says on the sign. Anscombe would mostly agree. Anscombe was an extreme social conservative I almost never agree with, but I think she got this issue right. Thanks for the suggestion, bacopa. I chose the photo for the blog post as a good one representing antiwar in general.